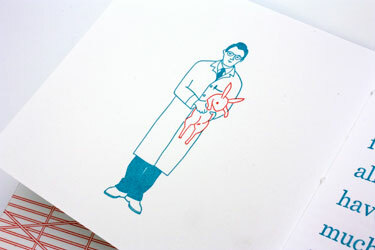 Rabbitpox, written and illustrated by Allison Weiner, casts rabbits as the heroes and the pawns in a tale of biological warfare. The story is inspired by a 2004 Harper's Magazine item describing American scientists as having engineered extra-lethal forms of mousepox, cowpox and, of course, rabbitpox. 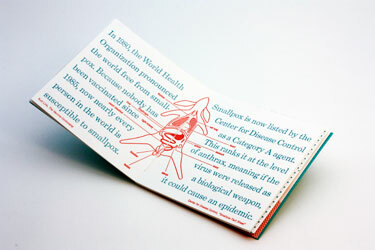 Allison's book combines text, inventive design, and diagrammatic illustrations with a whole lot of personality to find humor, absurdity, and alarm at the dark extremes of biological science. 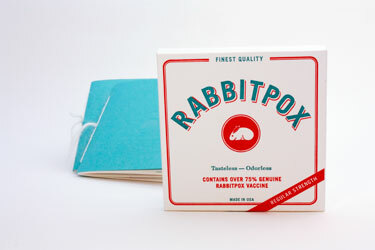 The type in Rabbitpox was hand set in Century Schoolbook and printed on a Vandercook proof press by Allison, Pam DeLuco and SFCB's generous volunteers. Each book is housed in a handmade box and bound with thread spun by Pam from the fur of her pet rabbit Charisma, a white German Angora who reportedly had a show career. Allison lives in San Francisco. She spends her work days making books at Chronicle Books and her weekends pampering her pug. 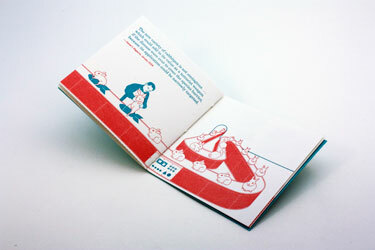 She has a degree in graphic design from California College of the Arts and one in art history from Stanford University.